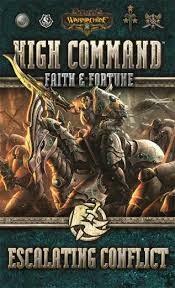 • Bolster your armies with Escalating Conflict, an 84-card expansion for WARMACHINE High Command Faith & Fortune! Escalating Conflict contains 5 copies each of 16 different cards, plus 4 additional warcaster cards, to bring new strategies to your Retribution of Scyrah, Convergence of Cyriss, Highborn Covenant, and Four Star Syndicate decks. • Requires the WARMACHINE High Command Faith & Fortune core set (PIP 61020) to play.